Yeah, I finally finished Winter Dragon on Outi’s RR. I am soo excited. I really enjoyed the majority of this Round Robin, but all the backstitching with blending filament on this one was not one of my high points. With the finish of this, my stitching obligations for this RR are officially over. The final maildate is not until December 1, but I didn’t want to get stuck on it around the time the baby came. I am glad that Jenna was able to accomodate me by sending Outi’s on to me early as I don’t think I might have given up if I had also had a new baby in the house:) Thanks. So here he is an now the lovely fabbie is back to Jenna to stitch Autumn. In other stitching news I am about half way done with the beading on Stargazer. 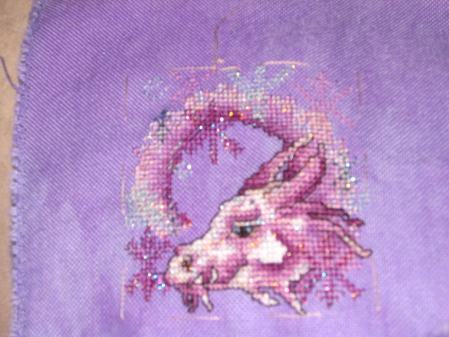 Now that I am done with the Dragon for tonight, I am going to treat myself to some beading the rest of the evening. (On a sidenote…if you ever stitch Stargazer, I would definitly purchase two boxes of the Mill Hill beads #03037. I only made it about halfway through the symbols for that color before running out and I know only about 4-5 beads got sacrificed to the couch gods:) ). Then tomorrow it is on to my next rotation slot, M9. As part of my 5-10 hours committment to each slot, I am also setting myself some reasonable little goals for each slot. On my M9 slot, I would like to get one more of the outer staircases done. Beautiful dragon – the colours look lovely on the fabric – well done! This is a beautiful finish. Congratulations!! Congratulations on a beautiful finish. The dragon is gorgeous – and very sparkly. I love winter dragon on that fabric! How beautiful! BEAUTIFUL dragon! Outi will be so thrilled! It looks beautiful. That fabric is gorgeous. Woot! Great finish, Leslie! Congratulations. It certainly looks worth the trouble. Wow! That dragon looks just fantastic! And so shimmery!